Merville Battery (optional) - The members of 9th Para, British 6th Airborne Div., commanded by Lt. Col. Otway, were to train for months for the taking of Merville battery. However, only a few things went according to the plan on D-Day. Paratroopers drowned in the marshes or had been scattered over several kilometers. Yet the "Red Devils" improvised on the assault of the battery and finally managed to seize the bunkers one after another. Their decisive actions led to a mission accomplished before dawn. Ranville British Cemetery - Ranville was the first village to be liberated by British paratroopers and its churchyard was used as burial ground for the men who had fallen on D-Day. Shortly after, adjacent to the church a graveyard was created. When the war ended, the site was chosen to regroup burials from this part of the battlefield. Graves were moved from Amfreville, Colleville-sur-Orne, Houlgate, Colombelles and Villers-sur-Mer. The Cemetery contains today 2,235 Commonwealth WWII burials, 97 of them unidentified, but also 330 German graves. 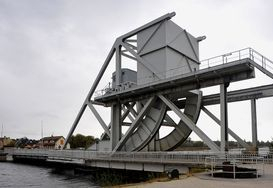 Pegasus Bridge (photo 1) - The delicate task to capture the bridges over Orne River and Caen Canal fell to a selected group of men, members of D Company, 2nd Oxfordshire and Buckinghamshire Light Infantry, and the Royal Engineers. Six gliders were to land very close to the bridges in order to allow Maj. John Howard and his "chaps" to seize them quickly and intact. It came to be known as the most outstanding flying achievement of the war and the bridges were taken in less than 15 minutes! Nowadays, one of the original bridges captured on D-Day and baptized Pegasus is displayed in the courtyard of a museum inaugurated in 2004 by HRH Prince of Wales. Sword Beach and Ouistreham Bunker - "Sword" represented the easternmost sector of the landing beaches as well as the narrowest of them all. Nevertheless, for many reasons, this beach was the key of the Normandy landings. Being the closest to Caen, region's capital and gateway to Paris, the Allies knew that getting a foothold in this area was indispensable for the success of the operation. 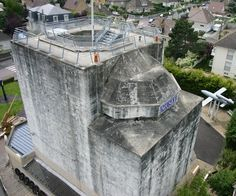 At Ouistreham, the "Grand Bunker" (photo 2) overlooking back in the day "Riva Bella" was rebuilt after the war. Today a museum, this 52ft tall concrete blockhouse reflects the German stubbornness and the amount work they put into the fortifications the deemed necessary to stop an invasion. Colleville-Montgomery and "Hillman" - This German strongpoint was part of a series of defenses located inland from "Sword Beach", the same beach on which the British 3rd Infantry Div. was to land on D-Day. The attack on this objective was launched around 01.00 p.m by the 1st Suffolk Regiment but "Hillman" was to fall only after two subsequent offensives in which the British forces suffered heavy casualties. Mont Fleury Battery (Ver s/ Mer) - Located at Ver sur Mer ("King Sector", "Gold Beach"), this battery presented itself as a threat to the Anglo-Canadian landings since the Allies thought it had a field of fire covering both "Gold" and "Juno" beaches. Although the works started in April 1944 according to the latest time-saving methods, the battery was still under construction in June when it was captured by Sgt. Maj. Stan Hollis and the members of D-company, 6th battalion of the Green Howards. They had stormed the beach that morning only a few hundred yards in front of the battery.